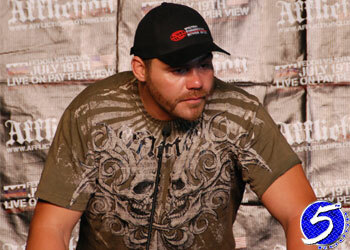 The fiasco that has become Tim Sylvia’s career has taken yet another turn after he was put to sleep by Ray Mercer this weekend at “Adrenaline MMA III.” The MMA fighter/aspiring boxer has been yanked from his “Affliction: Trilogy” scrap against Paul Buentello following his embarrassing 10 second knockout loss. This lowly anticipated heavyweight bout was initially slated to mark Sylvia’s professional boxing debut. After multiple delays and cancellations, the event finally went off this past Saturday inside the Birmingham Jefferson Civic Center in Birmingham, Alabama. The Association of Boxing Commissions abruptly pumped the breaks on the boxing match, forcing the promotion to change the fight to an MMA affair just two days prior to game time. Most would think that kind of switch would favor the former two-time UFC champ … apparantly not. This sideshow act, parlayed with his loss to Fedor Emelianenko at “Affliction: Banned,” means Sylvia has dropped his last two fights in a combined 46 seconds. Atencio told the website that Buentello will remain on their third MMA event, however would likely square off against the winner of the Gilbert Yvel vs. Pedro Rizzo fight set for the “Ultimate Chaos” show in Biloxi, Mississippi. Atencio himself will be putting his perfect 1-0 professional record on the line against Randy Hedderick as he makes his return to MMA fighting on that same June 27th card.